Softcover, 8 in. x 10 in. 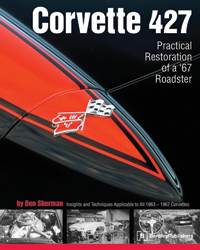 "This book would be an inspiration for the restoration of not just a Corvette of any year, but almost any make or model car..."
Corvette 427: Practical Restoration of a '67 Roadster is ideal for anyone interested in learning what really goes into classic auto restoration. 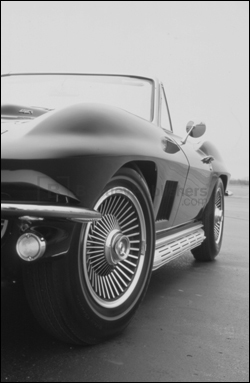 The 1967 427 Corvette roadster is a classic sportscar and highly sought after by collectors and enthusiasts. Don Sherman is a well-known and well-respected automotive writer. Corvette 427: Practical Restoration of a '67 Roadster brings together these two veterans in a unique book. Sherman himself performed most of the work on the car, with an eye to restoring his Corvette as a practical road car as well as a show car. 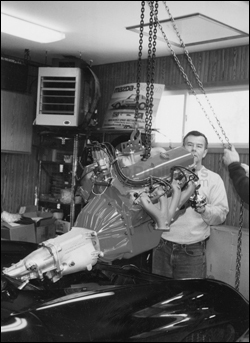 Sherman shares aspects of his frame-up restoration including what worked, what didn't, and what almost did - like the several different brands of Corvette idler arms that he tried until he got the one that really made the difference in the car's steering. With detailed photographs and a storyteller's talent for anecdote, Sherman chronicles each month, chapter by chapter, of the two years it took to restore a former drag-racing beater into a streetable blue-ribbon beauty. Focusing on a practical restoration, Don goes through the adaptations and hard decisions necessary to make a classic car a joy to drive, while staying true to the original designs of the factory. Amateur auto restorers, classic car fans, and Corvette lovers alike will appreciate this sometimes ecstatic, sometimes painful, and ultimately rewarding tale of what a dedicated enthusiast did for love, and will celebrate along with him the glorious results of a restoration beautifully done. Don Sherman provides the valuable practical information that only comes from hands-on experience-information that will make any restoration much easier and much more fun.